"The assault on Copenhagen" and "Siege of Copenhagen" redirect here. For the British investment and bombardment during the Napoleonic Wars, see Battle of Copenhagen (1807). For the siege during the War of the Outlaws, see Siege of Copenhagen (1289). The assault on Copenhagen on 11 February 1659 was a major battle during the Second Northern War, taking place during the siege of Copenhagen by the Swedish army. During the Northern Wars, the Swedish army under Charles X Gustav of Sweden, after invading the Danish mainland of Jutland, swiftly crossed the frozen straits and occupied most of the Danish island of Zealand, with the invasion beginning on February 11, 1658. 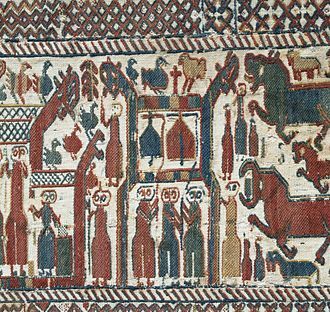 This forced the Danes to sue for peace. A preliminary treaty, the Treaty of Taastrup, was signed on February 18, 1658 with the final treaty, the Treaty of Roskilde, signed on February 26, 1658, granting Sweden major territorial gains. 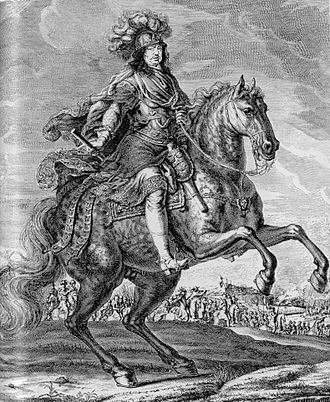 The Swedish king, however, was not content with his stunning victory, and at the Privy Council held at Gottorp on July 7, Charles X Gustav resolved to wipe his inconvenient rival from the map of Europe. Without any warning, in defiance of international treaty, he ordered his troops to attack Denmark-Norway a second time. 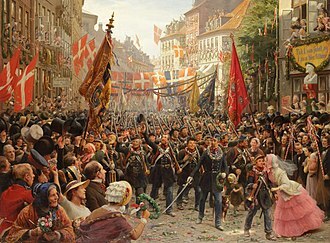 The Swedish armies had never left Denmark after the peace and already occupied all of Denmark apart from the capital, Copenhagen. After a failed assault, Copenhagen was put under siege in the hope of breaking the defense by starvation. In October 1658 however a Dutch relief fleet under Lieutenant-Admiral Jacob van Wassenaer Obdam defeated the Swedish fleet in the Battle of the Sound and lifted the sea blockade so that supplies and an auxiliary army could reach the capital. The Dutch were an ally of Denmark from the Anglo-Dutch Wars and were afraid that Swedish control of the Baltic would ruin their profitable trade in this area. After the Copenhageners had withstood about six months of siege, bombardments and attacks, the Swedes attempted to take the city by a grand assault, as a prolonged siege no longer offered any hope of success, now that the sea lanes had been opened by the Dutch. 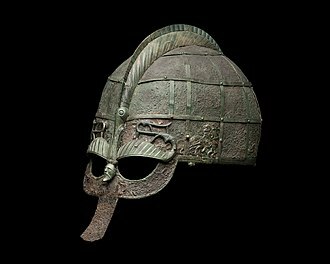 The Copenhageners had been forewarned by spies, so they had planned their defences well and stockpiled weapons and ammunition. The walls of Copenhagen bristled with about 300 pieces of cannon, mortars and other artillery, while a diverse mixture of weapons, ranging from muskets and arquebuses to morningstars, scythes, boiling water and tar had been readied for action. Craftsmen, students and other civilians were divided into nine companies, and each of these companies was allocated a part of the wall to defend. The professional soldiers were stationed at the outer field works, Kastellet (the Citadel) and Slotsholmen (the Castle Islet). The Swedish army consisted of about 9,000 professional soldiers, while the Danish defenders, a mixture of professionals, militia and raw civilians, were of an equal number. The Swedes started the action by making a diversionary attack at Christianshavn and Slotsholmen at the evening on 9 February. They were repulsed, and the Swedes left one of their assault bridges behind, which the Danes captured and measured. They found that the Swedish assault bridges were 36 feet long, and thus they realised that they could render these bridges useless by making the ice free parts of the moats wider than that. The moats and the beaches had been kept free of ice, and now the ice free zones were widened to 44 feet with help from 600 Dutch marines. The ice was thick, and the work was done in heavy snowfall from 4 o'clock in the afternoon till evening on the 10 February. Spies reported that the Swedish army had moved from their camp, Carlstad, at Brønshøj and had taken up positions behind Valby Hill, and when the Swedes began their assault about midnight the same evening, they met heavy resistance. The main assaults were made against Christianshavn and Vestervold, but the chopped-up ice and the massed weaponry on the wall made the densely packed attackers pay a horrific toll in lives. Still, they fought their way to the top of the wall, and fierce hand-to-hand fighting broke out. When the Swedes realised that the assaults on the Western part of the wall were in trouble, the choice was made to make a supporting attack at Østerport. The Swedes got very close to Nyboder and were in the process of crossing the moat, when they fell victim to a well-conducted ambush, and they withdrew with heavy losses. At about five in the morning the Swedes gave up and retreated. They had taken severe losses. Before the walls 600 bodies were counted, and many more had perished in the ice-cold water and were never found. On top of that there were many wounded. 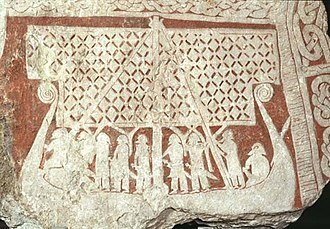 The Danes had only suffered about 17 dead. The Dutch in the spring of 1659 sent a second fleet and army under Vice-Admiral De Ruyter to further reinforce the city and cut the Swedish supply lines so that the siege would have to be lifted altogether. After Nyborg had been taken by a Dutch-Danish force, the Danish Isles were abandoned by the Swedes. Negotiations were opened and the Treaty of Copenhagen was signed on May 27, 1660, and it marked the conclusion of the Second Northern War between Sweden and the alliance of Denmark and the Polish-Lithuanian Commonwealth. In conjunction with the Treaty of Roskilde, it ended a generation of warfare and established the present-day borders of Denmark, Norway and Sweden. (in Swedish) Lars Ericson, "Köpenhamn 1659, Följden av en felritad karta" in Svenska slagfält. Stockholm, 2003, pp. 206–14. ISBN 91-46-20225-0. Battle was fought for about two hours, ending in Polish victory. It was first Polish success in the field since Swedish invasion of Poland in early summer 1655. The Polish forces won the battle, after the Battle of Jaroslaw, which took place on March 15,1656, Swedish forces under king Charles X Gustav found themselves in a difficult situation. They needed reinforcements, so on March 16, the king ordered his brother, Adolph John, to send the army of Frederick VI, Margrave of Baden-Durlach, in the second half of March 1656, the margrave left Warsaw, with 2,500 reiters and dragoons. His mission was to relieve main Swedish army, together with the king himself, the margrave and his soldiers had to cross the dense Kozienice Wilderness, where Swedish units were constantly attacked by Polish guerillas. After a few days, Frederick VI received a message from Charles Gustav, the Swedish king realized that main Polish forces, which had trapped him in the area of Gorzyce, headed northwards, to face Frederick. Polish hetmans Jerzy Lubomirski and Stefan Czarniecki were no longer in the area, Frederick VI obeyed royal order, and began a retreat, via Kozienice and Warka. When Polish forces reached Zwolen, after a march from Sandomierz. After both Swedish groups had joined, they crossed the Pilica, which lasted a whole night, at the same time, Polish forces under Lubomirski caught Swedish rear guard. The skirmish, which took place near Kozienice, ended with destruction of the Swedish unit. The survivors, who reached Frederick VI, told him about the danger, after leaving rear guard along the river, the Swedes formed a 4-kilometer long column, and began marching towards Warsaw. When Polish forces arrived, the column stretched from Piaseczno in the north to Warka in the south, Frederick VI did not feel threatened, as the Pilica was very wide after snowmelt, and there was no bridge available for Polish cavalry. The Poles, quickly found a ford, crossing the river near the village of Winiary, Polish forces were divided into three groups. The naval Battle of the Sound took place on 8 November 1658 during the Second Northern War, near the Sound or Øresund, just north of the Danish capital, Copenhagen. Sweden had invaded Denmark and an army under Charles X of Sweden had Copenhagen itself under siege, the Dutch fleet was sent to prevent Sweden from gaining control of both sides of the Sound and thereby controlling access to the Baltic Sea as well as of its trade. The Dutch were grouped into three squadrons, while the Swedes separated their ships into four, the seven Danish ships with about 280 guns were unable to assist their Dutch allies because of adverse northern winds and could only watch. This was a reference to the English, whose powerful fleet had recently defeated the Dutch in the First Anglo-Dutch War, in the event, however. The Swedes attacked aggressively, but failed to gain the upper hand, the Dutch forced the Swedish fleet to end the blockade of the Danish capital, enabling its resupply by Dutch armed transport ships, which eventually forced Charles to abandon the siege entirely. The Battle of Chojnice was a surprise nighttime attack followed by a run-and-chase battle during The Deluge. 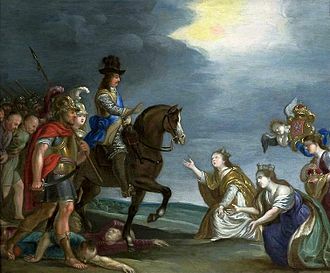 Towards the end of 1656, the Swedish army was blocking Polish King John Casimir in Gdańsk who was conducting negotiations with French King Louis XIVs envoy Antoine de Lumbres. 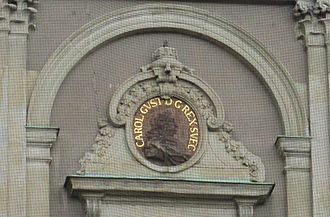 Polish Queen Marie Louise Gonzaga wanted to join her husband there, Czarniecki came to Wolbórz where she was stationed and together they began the so-called Gdańsk expedition. On or about January 1,1657, Czarniecki with his division, army divisions of grand Crown hetman Stanisław Rewera Potocki and field crown hetman Stanisław Lanckoroński joined them at Chojnice about the same time. Polish cavalry companies settled in the countryside, occupying villages and being separated one from another by distance, need for fodder and food. 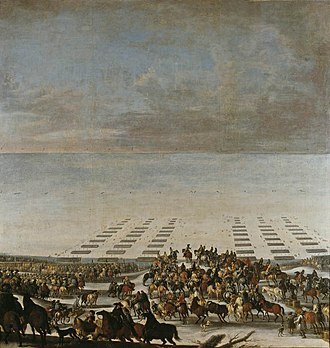 Different sources give different renditions of the battle, Swedish army came up to Chojnice on the night of January 2,1657, and the first to attack was the Swedish vanguard under Rutger von Ascheberg, commanding almost 1,000 horsemen/reitars. His command attacked immediately the following Polish formations, pułk of prince Konstanty Wiśniowiecki, Polish losses, listed for the battle, were sustained during that phase of the battle -according to des Noyers reports. Runaways from the Wisniowieckis command spread the alarm across the town of Chojnice. It gave ample time to other Polish units to assemble and meet the enemy on equal terms, ar some moment heavy night fighting reached the queens wagon train and she had to seek shelter, perhaps in the town itself. Once her majesty queen was safe she gave blessing to Czarniecki so he could come to the rescue of prince Wisniowiecki pulk. And perhaps other Polish army divisions came to give more coordinated response to the Swedish vanguard onslaught, perhaps at that moment quite victorious Swedish commander must have realized that he had stepped into the hornets nest and begun hasty retreat - according to des Noyers bride abattue. His retreat was towards the old Teutonic Knights fortress at Czŀuchów, in Swedish hands, Polish army sustained light casualties, less than 50 killed and wounded, and 9 taken prisoner, number of horses and wagons were taken in the initial surprise attack. The battle ended in Swedish victory. In the early stages of the Siege of Krakow, Polish royal units of Hetman Lanckoronski decided to abandon the city, together with king Jan Kazimierz, the Poles headed eastwards, to Tarnów. At some point, the king with the court turned southwards, to Nowy Wisnicz and Nowy Sacz. Swedish king Charles Gustav, who commanded the siege of Krakow, decided to chase the Poles, Charles Gustav had app.5,000 soldiers, mostly infantry, while Polish units were more numerous, including the hussars under Stanislaw Koniecpolski. The Poles camped among the hills in the vicinity of the town of Wojnicz, due to poor visibility, the Swedes sent two cavalry regiments for reconnaissance purposes. The regiments clashed with Polish cavalry, which was sent for the same purpose, the skirmish turned into a full-scale battle, which took place in the Polish camp, among tents. Charles Gustav quickly sent reinforcements, attacking wings of the Polish cavalry, under pressure of disciplined Swedish musketeers and their firepower, the hussars, who were elite force of the Polish army, had to retreat behind the Dunajec. Swedish siege of Jasna Góra in 1655. Oil on canvas, 17th century. Malarnia Jasnogórska, Jasna Góra, Sala Rycerska. Defence of Jasna Góra, engraving reproduction. Painting by Peter van de Velde. Bremervörde in Swedish Bremen-Verden under Swedish attack in 1658. Landgangen i Kerteminde 1659 by Christian Mølsted. Landing at Funen, shortly before the battle of Nyborg. The battle, painted by Erik Dahlbergh. A drawing of Kokenhusen and its fortress about 30 years prior to the storming.